It’s a wet and windy day as we drive up the long country road. Sheep huddle on flooding paddocks. This place is really rural I think to myself. But most of New Zealand is. When a “journalist” visited the farm to write a piece in the paper and heard that no agri-chemicals and fertilizers were being used, that grazing was being done in a carbon sequestering manner, they made sure not to let the story go to press. It certainly contradicted their advertisers’ agendas. 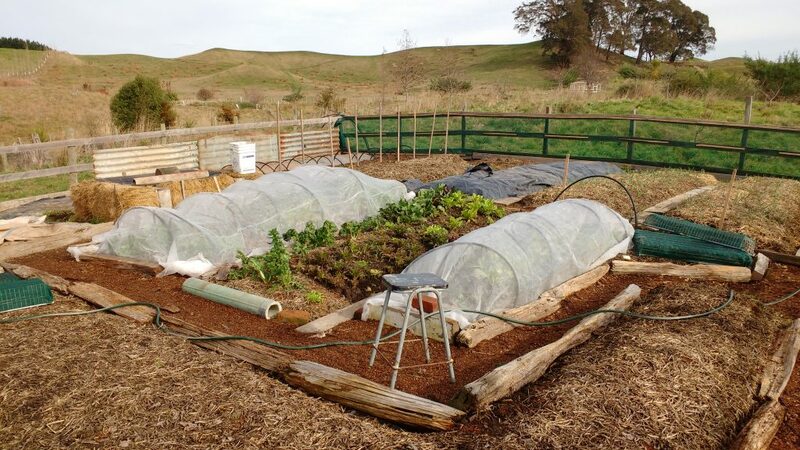 Here lies an account of my time WWOOFing (worldwide opportunities on organic farms) on New Zealand’s north island in the Hawke’s Bay region. The farm I was at is known throughout the country for its use of permaculture principles, regenerative ag and holistic land management. The Family Farm at Mangarara Sheep Station puts right livelihood into practice, along with land stewardship and slow money. The Hart family opened their doors to me for 2 weeks where I also spent considerable time helping out and learning an immense amount from the wonderful Maori family renting and farmsteading on the property. I am so grateful to have had this adventure. The fantails chirp exuberantly and I can hear sheep faintly “baaaing” in the distance. 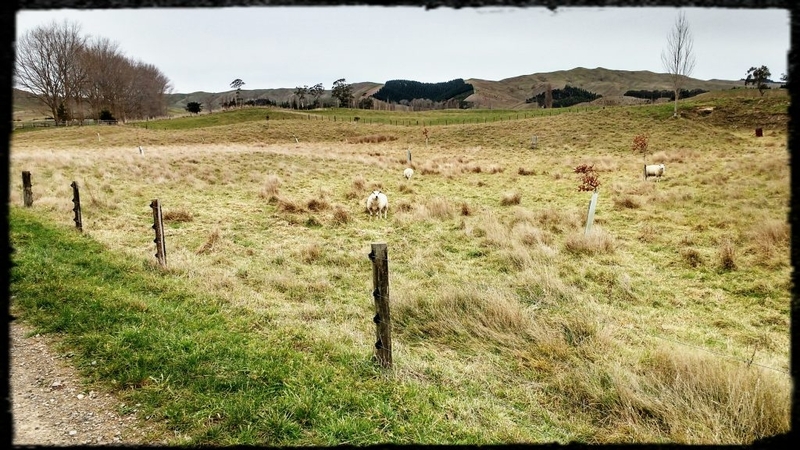 I’m on a New Zealand sheep farm I remember with delight, something I have dreamed of for so long. It is early morning and the rains have stopped. It’s the first day, the day I learned how to defeather and gut a turkey, blood and all. My hosts are a Maori family of 5 truly living with the land. Previously, they lived without electricity and even more simply on their ancestral lands nearby seeking a way out from the disconnection and degradation conjured daily in a western post-industrial lifestyle and the increasingly precarious times ensuing before our eyes. As fully trained teachers, they even homeschool their 3 kids. You see the neighbor has these turkeys they tell me, that run wild and have become a pest. The boys have piled into the farm vehicle clutching their hunting rifles, “We’re gonna get us some birds,” they shout in their adorable kiwi accents. I sit in the garden pictured below, weeding, awaiting our trophy, secretly fearing the ghastly dead creature I will have to touch with my bare hands. You see I come from Canada’s largest metropolis, similar to two generations before me and it today numbers more than the entire population of New Zealand. The only meat I have ever known came shrink wrapped on Styrofoam, brightly branded “Kosher.” I know how to navigate overcrowded urban subways and parallel park in downtown rush hour. But this is a life I yearn for believe it or not. Regrettably, my city slicker oblivion would lead to much humiliation. The boys return victorious. Birds hanging out the back of the vehicle. I’m going to do this I tell myself. We gather bins for the feathers. I grip the bird’s head and wings. It’s still warm and the blood is sticky on its feathers. I begin plucking out handfuls of them. Each feather revealing more bumpy skin. It feels familiar. This is what my great-grandmothers did every Friday afternoon. This is how they survived. My hosts have the first bird on a butcher’s hook, blood spewing as they gut it. My back is to them. I am intent on pulling these large black speckled wing feathers out. The sounds of my hosts locating the innards surround me and I soon begin looking on. Frozen in awe I feel both shocked and amazed by the bloody self-reliant task. This is where my food comes from…the land. A new sense of connection comes over me. This is what real food is, untainted by pharmaceutical and GMO-laden feed that is the opposite of pasture. I keep some of the feathers in a vase. I will never forget that liberating feeling of yielding self-sufficient food. It tastes phenomenal too. Fast forward a week and I have been entrusted with the farm vehicle. It’s hard to start in the mornings but once you get it going there’s nothing like flying down the dirt farm road, frosty wind ripping at your face and hands, the morning horizon ablaze over the Eucalyptus trees. Despite my humiliation at not knowing what a Eucalyptus tree looks like, I am keen to extract dye from their leaves. They are large grandfatherly trees that tower over the pig pen. Lucky the boar meditates ponderously on them daily. I have been a huge fan of the Australian natural textile artist India Flint for almost ten years. 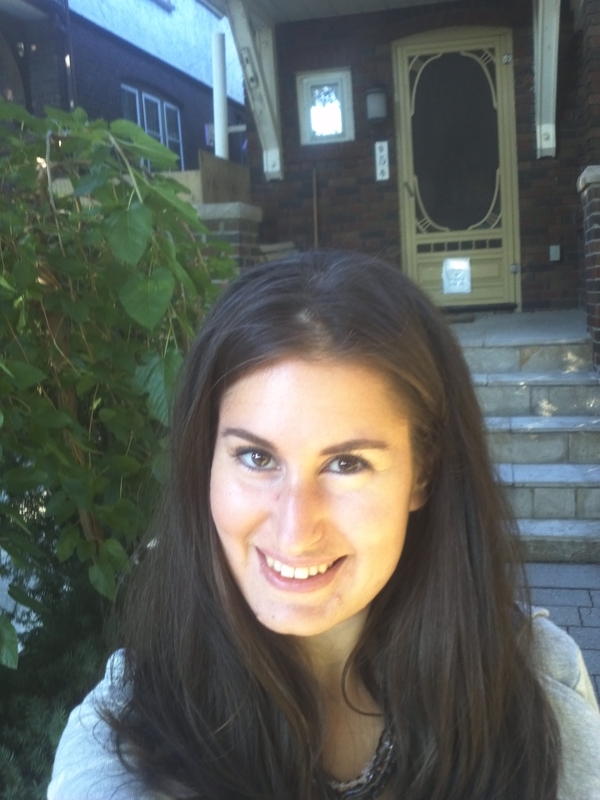 She coined the term eco-printing with her book Eco Colour. The windy winter storms have left fallen branches scattered under a grove of trees. I fill a bucket that I boil once I’ve affixed it to cotton with thread and leave it soaking overnight. By morning, the water has turned a bright red and turned the fabric pink! Unfortunately, the fabric would later get left behind in my Swedish friends’ car after getting unhinged from my backpack on the way to the airport…it’s now a wall hanging in Europe. The farm is part of a land trust, this means that its mission is to actively conserve land by being regenerative land stewards. The trust has partnered with Air New Zealand to restore local native plants and trees throughout the property. I planted dozens of manuka (where that expensive honey comes from), kanuka, harakeke (flax) among other species as it rained ensuring I became a sufficiently muddy eco warrior woman that apparently pampers each tree too much. The earth is heavy and as I plant manuka in the rain I think about how it’s simple acts that have profound effects. This simple repetitive act is the slow regeneration of what has been lost through one of the world’s most pressing issues: deforestation. 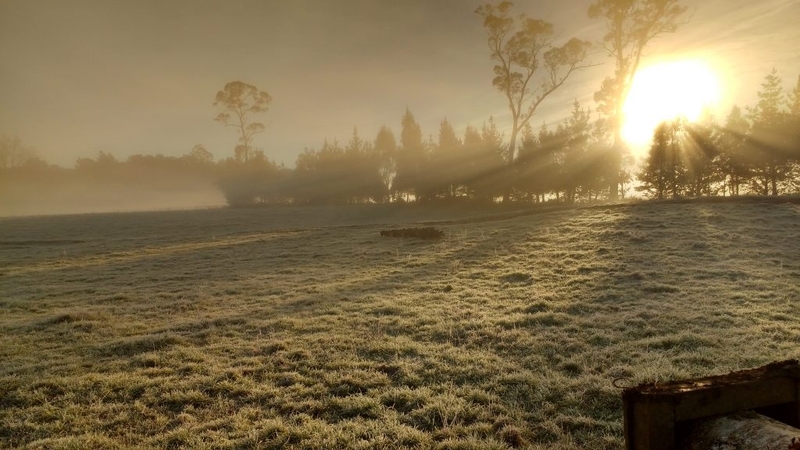 If we all slowed down a bit perhaps we could evoke a little of the quiet rebellious ethos of farmsteading…the slow restorative kind that yields trees of life nourishing and protecting that Hawkes’ Bay hillside. It’s a lesson I carry with me back to the urban jungle I find myself in. You have to be the change. No one is gonna adapt for you. 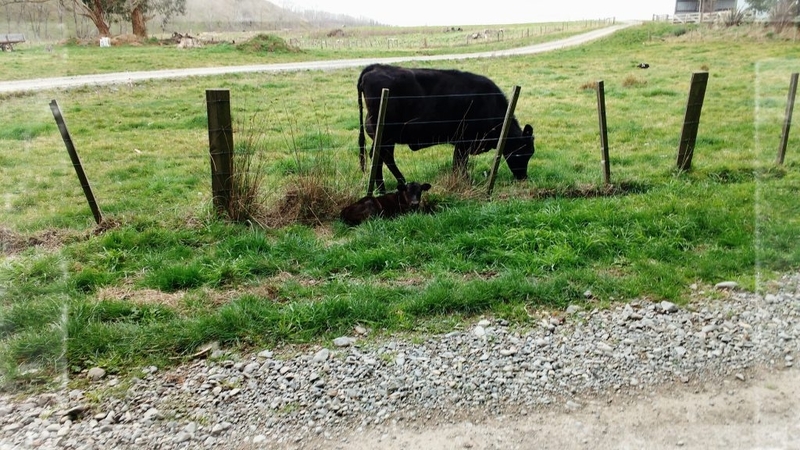 Mom and 2 day old calf: Mom has just been milked, calf guards the delicious pasture. Dalia Levy is a slow textiles artist, and urban permaculturalist with a penchant for travel. 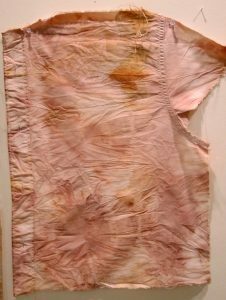 Her textile art practice employs natural dyeing as a medium to experiment with and share nature’s bounty, in turn, cultivating her creative passions sustainably. Dalia is committed to reviving wearable folk traditions that challenge an extractive economy and grows local fibre and colour within a regenerative paradigm. Her writing has appeared in “The Wheel”, and “Green Teacher” magazines and her artwork, Wildcrafted Wool, can be found on Etsy. She lives in Vancouver, BC, Canada, unceded Coast Salish Territory and blogs at www.permacultureartisan.com. All images belong to Dalia Levy.